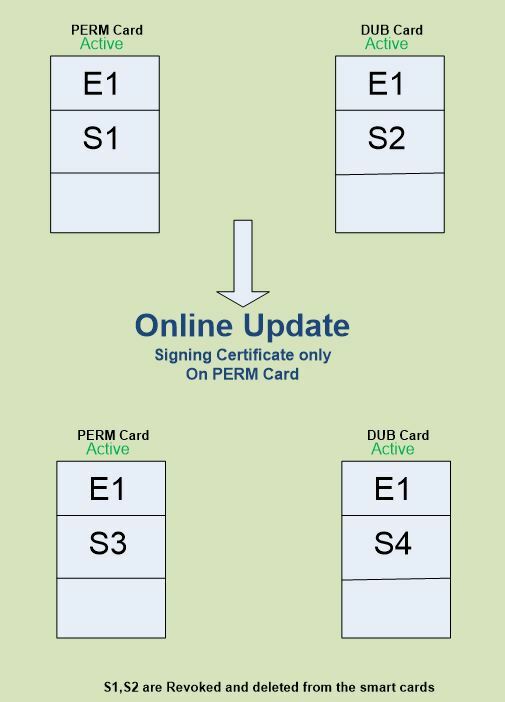 If you are a FIM CM Administrator, then part of your work is to manage smart cards using the FIM CM Portal. 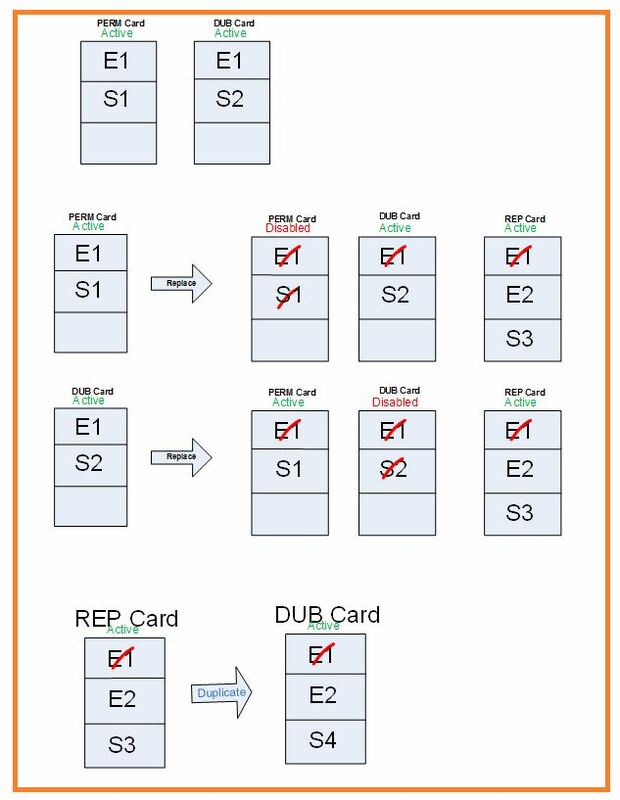 Now, this is what will happen : If you have a smart card with E1 and S1 (Encryption and signing certificates inside the smart card) , and you happen to have a duplicate smart card (DUB) with of course E1 and S2 (the same encryption certificate but different signing certificate), then replacing the permanent smart card will do what the figure shows. 1. 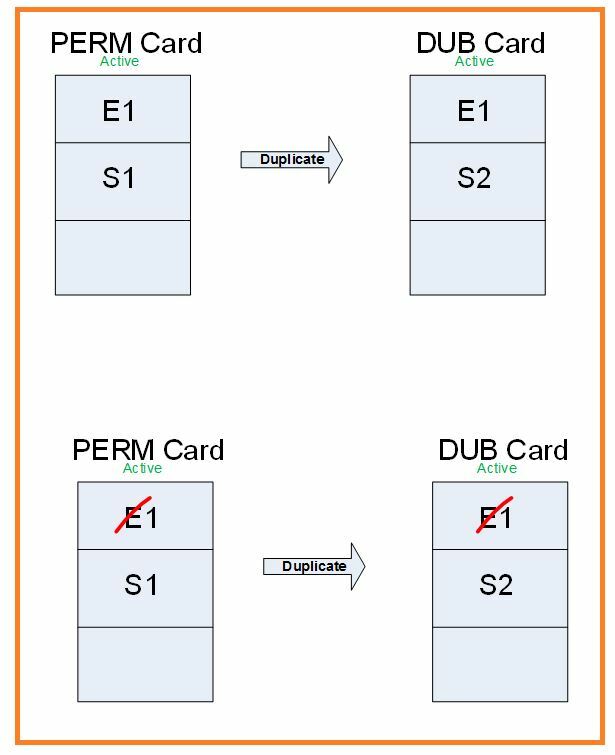 Revoke all certificates on the Duplicate Card – Duplicate smart card will not be anymore assigned to the user – smart card doesn’t have any certificates as they are deleted. 2. Disable the permanent Smart Card (which will revoke all certificates on the card) –Permanent smart card will still assigned to the user –smart card still have certificates but are revoked so they can be used to recover encrypted files. 1. Revoke all certificates on the Permanent Card – Permanent Card will not be anymore assigned to the user – smart card doesn’t have any certificates as they are deleted. 1. Disable the Duplicate Smart Card (which will revoke all certificates on the card) –Duplicate smart card will still assigned to the user –smart card still have certificates but are revoked so they can be used to recover encrypted files. Action: Administrator performed online update for the PERM card and chooses (Certificate Content Change) and chooses to update only (Signing Certificate Template). Online Update cannot be done fully from the administrator workstation. Thus , the (Update Initiator) will initiate the request of Online Update for a smart card , after this action is approved in a workflow as described in the management policy workflow ,the user will should logon to the FIM Client site and should check his requests. He will see two approved Requests for Online Update (one for each card).The user then should insert his permanent smart card and choose to execute the first approved online update ,and then insert the second duplicate smart card and choose to execute the second approved online update. 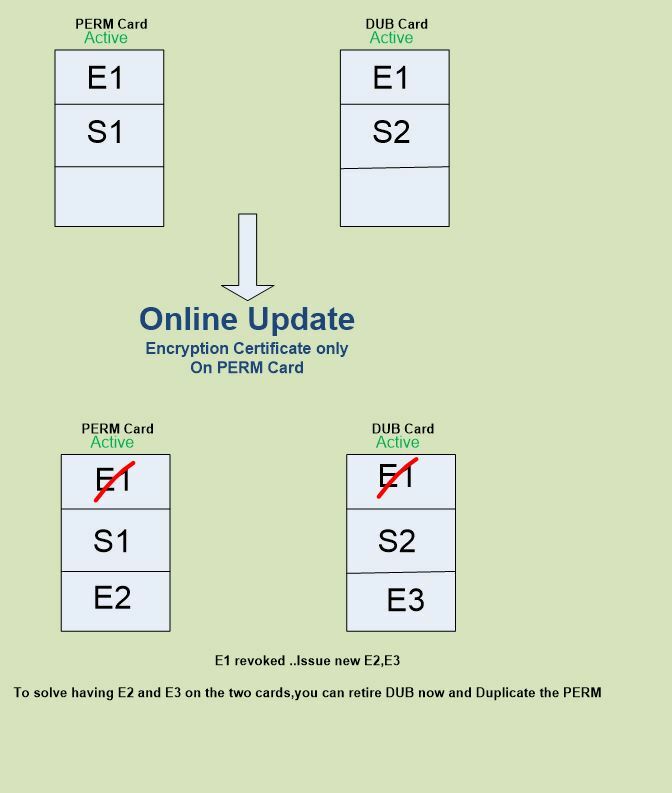 The user will end up with two smart card with the encryption certificate non touched .But both signing certificates on the smart cards will be revoked and deleted and new ones issued and printed on the smart cards as shown on the figure below. Action: Administrator performed online update for the PERM card and chooses (Certificate Content Change) and chooses to update only (Encryption Certificate Template). Online Update cannot be done fully from the administrator workstation. Thus, the (Update Initiator) will initiate the request of Online Update for a smart card, after this action is approved in a workflow as described in the management policy workflow, the user will should logon to the FIM Client site and should check his requests. 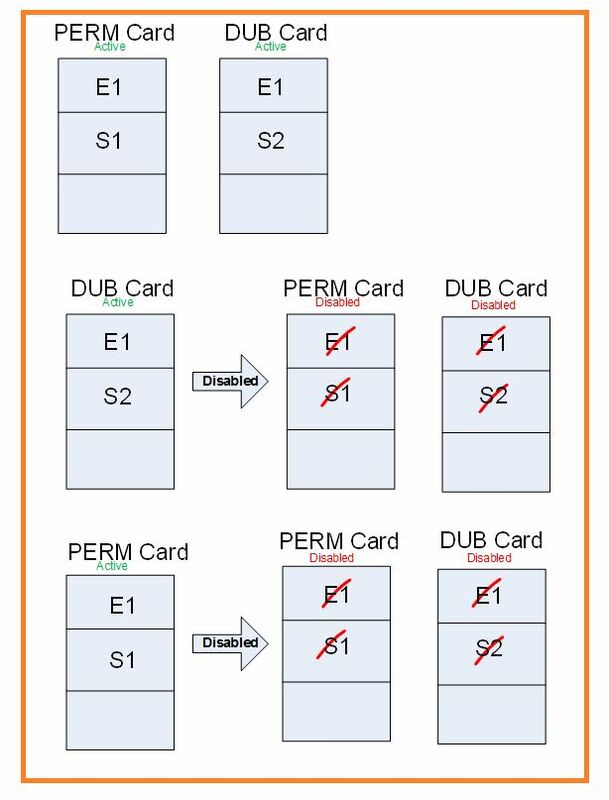 He will see two approved Requests for Online Update (one for each card).The user then should insert his permanent smart card and choose to execute the first approved online update ,and then insert the second duplicate smart card and choose to execute the second approved online update. The user will end up with two smart card with the signing certificates non touched .But the encryption certificate (E1) will be revoked and kept on the smart cards for recovery usage. 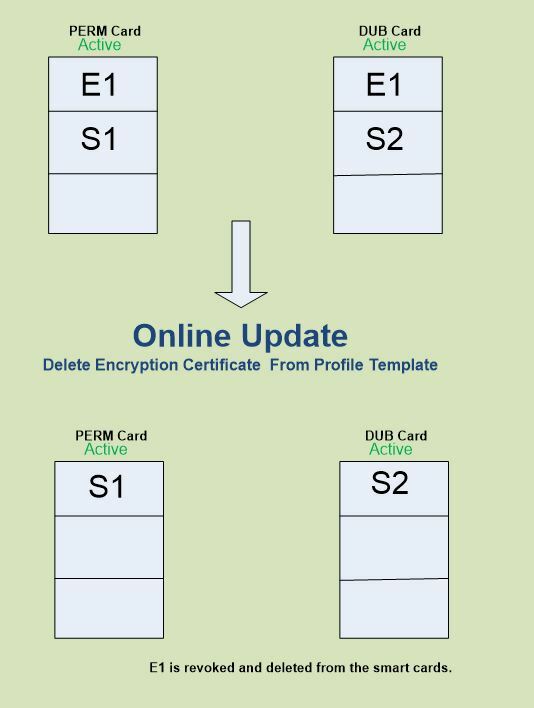 Now, a new encryption certificates E2,E3 will be issued and printed on the cards as shown on the figure below. 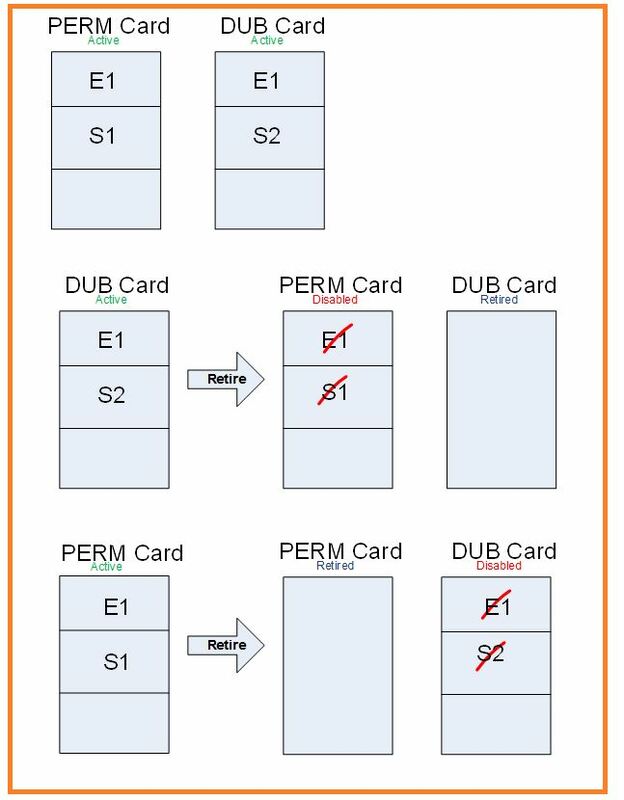 The user will end up with two cards and with two encryption certificates E1 and E2 .To solve this ,you can now retire Smart card DUB (this will revoke and delete S2,E2) and then duplicate the PERM card .After all is done ,the DUB card will have ( S3,E2, and the revoked E1). 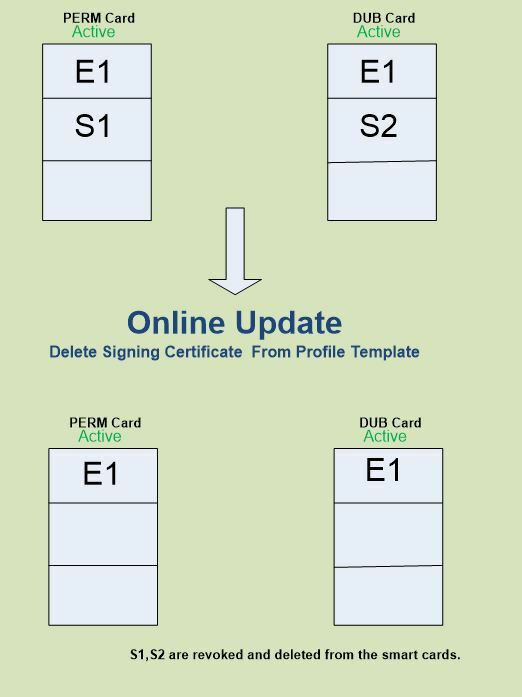 Action: Now the administrator deleted the signing certificate from the profile template and initiated an online update of the smart card (doesn’t matter if it is the PERM card or the DUB card). Online Update cannot be done fully from the administrator workstation. Thus, the (Update Initiator) will initiate the request of Online Update for a smart card, after this action is approved in a workflow as described in the management policy workflow, the user will should login to the FIM Client site and should check his requests. He will see two approved Requests for Online Update (one for each card).The user then should insert his permanent smart card and choose to execute the first approved online update ,and then insert the second duplicate smart card and choose to execute the second approved online update. The user will end up with two smart card with the signing certificates revoked and deleted .The encryption certificate is not touched. Action: Now the administrator deleted the Encryption certificate from the profile template and initiated an online update of the smart card (doesn’t matter if it is the PERM card or the DUB card). The user will end up with two smart card with the Encryption certificates revoked and deleted .The signing certificates is not touched.